Hello and welcome to my stop for this week’s blog tour featuring the #StrangeLit bundle, #FatefulTurns! For this round, I’ve chosen to interview Chi Yu Rodriguez, author of Sparks of Circumstance. At eighteen, Jana Cross begins to dream. Sometimes, her dreams are of a cafe that sells a different kind of coffee. Here, espresso shots are focus and discipline, sugars and syrups are encouragement, tea and milk are calm, and whipped cream is joy. Sometimes, she dreams of another realm, an enchanted forest with different creatures doing her bidding and her subjects calling her by a different name. She dreams of power, of striking fear. She dreams of things that aren’t real. When danger finds Jana, she begins to follow her dreams. Will they lead her to her death? Or will they finally lead her to the truth? Get the #FatefulTurns bundle (ONLY P45 this week!) on Buqo to read this story. I wanted to try something different for this interview, so I prepared small note cards on which I wrote a few keywords I got from reading Sparks of Circumstance. I asked the author to pick cards (which were presented face down) and she answered questions based on the keywords on the cards she picked. This is the very first Keyword Q&A I’ve done, and I intend to do more of it in the future, but for now, here’s Chi Yu Rodriguez talking about her favorite thing about the book, a bit about her writing process for SoC, and a brief introduction on what’s to come. Click on the Read More button to read the interview. The first word she picked out is FAVORITE. Q: Name your favorite anything from the story you wrote. Q: I know you created a world specifically for this story, can you tell us about the Eldunfolk? How did you come up with them, and how are they like? These huldrefolk, she continued, looked like humans but with monkey tails. They are also able to marry humans and have gifted children. As she went about conceptualizing her story, she ended up merging the idea of “elves as helpers” and huldrefolk, thus Eldunfolk. “They are not of this world but they live in another realm just under the surface. Just imagine, for example, you’re having a bad day. Nakaupo ka sa sidewalk tapos namomroblema ka, tapos may dumating na tao na tinulungan ka in some way. (Even if it’s) the smallest thing like, inabutan ka ng tissue pamunas ng pawis mo. Or kunwari 30 minutes ka nang nawawala tapos biglang may magtuturo na lang sa iyo (ng daan). Like good samaritans, I pointed out, and she agreed. Third, she picked out NAMES. Q: I noticed that you have very creative names for your characters, for most of them at least. What was the process you went through coming up with those names? Are there meanings behind the names? Cupid is called Cusp (from the word “cuspid”), because the character represents the meeting of two people. Empaths are called Vibbs, a wordplay on the word vibes. Alurs got their creature name from the word “allure,” because they have a seductive quality to them, like sirens, which was where their character profile was based on. The fourth keyword, which seemed to make her panic, was SNEAK PEEK. Q: Because the story is not finished yet, can you give us something to look forward to in your next book? Is there action? Is there a kissing scene (#priorities)? Q: How much have you written of this second book? Can you give me, say, a percentage? The fifth and last word she picked was BREW. 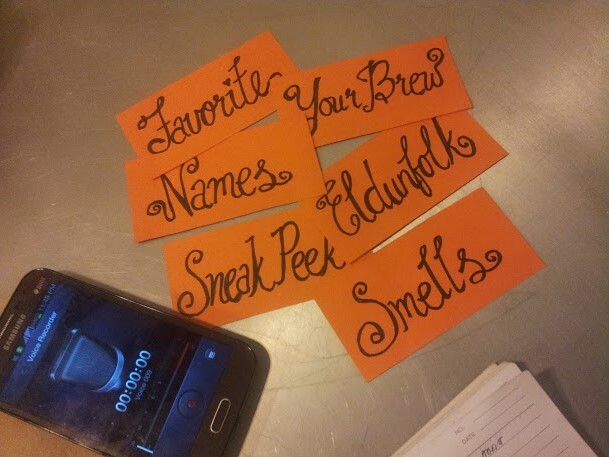 Q: If you were an Eldunfolk working in Brewdoo, what would be your specialty? You don’t have to name it, you can just tell me what it makes people do or what it causes people to feel . . .
Q: So basically, they’re gonna be flower people. The “make love, not war” kind. Chi’s keyword cards, taken after the interview. There was a last one that didn’t make it to the five Qs (“smells”). Thank you so much to The Bookish Diaries Book Tours for organizing this blog tour for us. If you want to visit their website, click on their nifty banner below. Next week, the #StrangeLit #DarkestDreams blog tour will be happening and I will be interviewing another author, so keep an eye out for that. In the meantime, I hope you guys take advantage of this week’s bundle SALE and enjoy the stories! Chi Rodriguez has many feelings. Sometimes these feelings find their way to paper in the form of short stories and fiction online. Sometimes they don’t come out at all and end up as unresolved sexual tension or terrible internal angst. She prefers making imaginary people go through these feelings for her pleasure. Her muses hate her for it, and they repay her by being forever fickle. She wrestles with them in her head everyday.